Anna Neagle starring in the film "The Lady with the Lamp". Lea Hurst was one of the homes belonging to the father of Florence Nightingale and the family moved into the property when Florence was about five years old. Her father, William Edward Shore, was the great nephew of Peter Nightingale and he added Nightingale to his surname following the death of his great uncle. William Adam, writing when Florence Nightingale was a young woman, mentioned Lea Hurst. "Passing over the small bridge [at Lea], we take the road leading up to a long and steep hill to the village of Holloway". 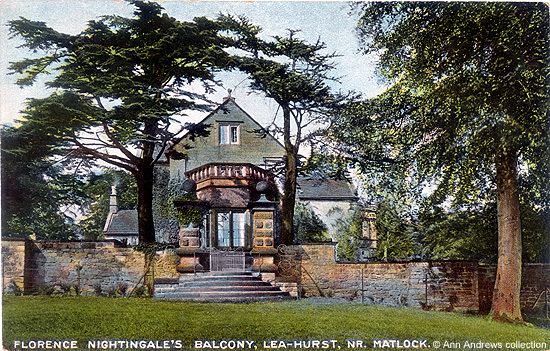 "Lea Hurst, the seat of William Nightingale Esq., is embosomed amongst the woods, to the right" (footnote). Pevsner, whose architectural guide was first published in 1953, described Leahurst as a "C17 gabled house with low mullioned windows, much enlarged in 1825". Describing the house as a place of national interest because of its association with Florence Nightingale, the 1920's Ward Lock Guides add that "it is one of the most beautiful places in the district. The park and grounds form a prominent feature in the landscape from any of the surrounding hills. The Hall, Elizabethan in style, is pleasantly situated on a sloping lawn, surrounded by trees". "Her balcony was a great joy to her, commanding a view of the garden with its stone terraces massed with flowers, and of a meadow beyond, losing itself among the trees running down to the river. Often the sound of the Derwent was in her ears, and she greatly recalled it one night at Scutari. There was a great storm, and suddenly Florence Nightingale said: " How I like to hear that ceaseless roar; it puts me in mind of the Derwent. How often I have listened to it from the nursery window!" If ever she lived to see England again, she wrote from the Crimea, the western breezes of her hilltop home would be her first longing". "On a hill opposite the village of Holloway stands Lea Hurst, an Elizabethan House, beautifully situated on the crest of the ridge. This was at one time a residence of the famous and beloved nurse of the Crimean wards - Miss Florence Nightingale. Continuing along the hillside beyond it, one enjoys a fine view across the Derwent valley." Florence Nightingale's sister Parthenope (Lady Verney) produced a delightful drawing of Lea Hurst which is now hung in the room known as the Museum on the first floor at Claydon House. The caption reads "Parthenope's drawing of Lea Hurst, Derbyshire. Home of Florence Nightingale". 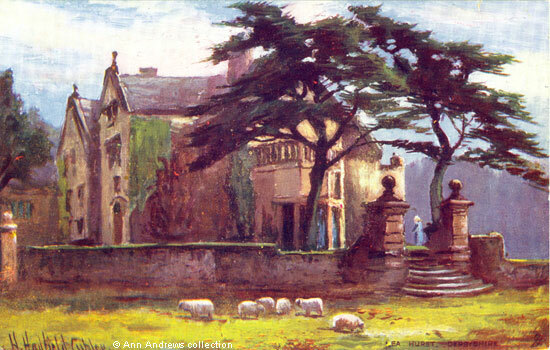 When she executed her drawing she must have sat in a very similar position to the one later chosen by Hadfield Cubley, although the two trees on either side of the gateway had grown up in the intervening years. 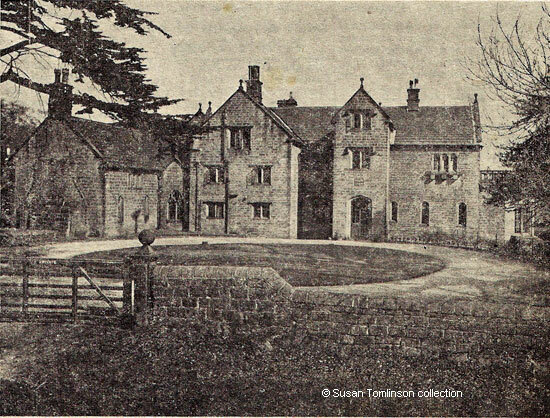 The final picture of Lea Hurst (below) was photographed by the auctioneers Marchant Brooks and Co. and published in the Matlock Mercury on 30 June 1951 in readiness for the sale of the property on 3 July. It was taken just before a film crew assembled at the house to shoot the last scenes of "The Lady of the Lamp" starring Anna Neagle. 1. "Florence Nightingale's Balcony, Lea Hurst, near Matlock" One of the Artistic Series, A.P. Co., 9 Bury Court, St. Mary Axe, London, E.C. No.2539. Chromotyped in Saxony. Exact date difficult as the card is not postmarked but first postal date known for their cards is now 1905 (see both Via Gellia, Tufa Cottage on this website and list of postcard publishers elsewhere on the internet which supplies the date of 1909). 2. "Lea Hurst, Derbyshire" published by Raphael Tuck & Sons "Oilette" [Regd.] Postcard 1680 Art Publishers to their Majesties the King and Queen "Picturesque Derbyshire". Printed in England. 3. Marchant Brooks photo from a copy of the Matlock Mercury © Susan Tomlinson collection. Parthenope's drawing of Lea Hurst is on display at Claydon House, Buckinghamshire. With grateful thanks to the archivist, Sue Baxter for providing the drawing's title.